The towing of the main deck frame for the Edvard Grieg topside commenced yesterday from Kvaerner Stord in Norway. In the coming days three more barges with modules will be towed to the Edvard Grieg field. More than 22, 000 tonnes of steel and equipment will constitute the complete topside. Edvard Grieg is one of the most complete topsides to be delivered to the North Sea development. This has set a new benchmark for the industry. The aim now is to complete as much work as possible at the quayside, reducing the need to complete the work offshore at a much higher price. The main deck frame, which forms the lower part of the platform, is currently on a barge being towed from Stord to the field. 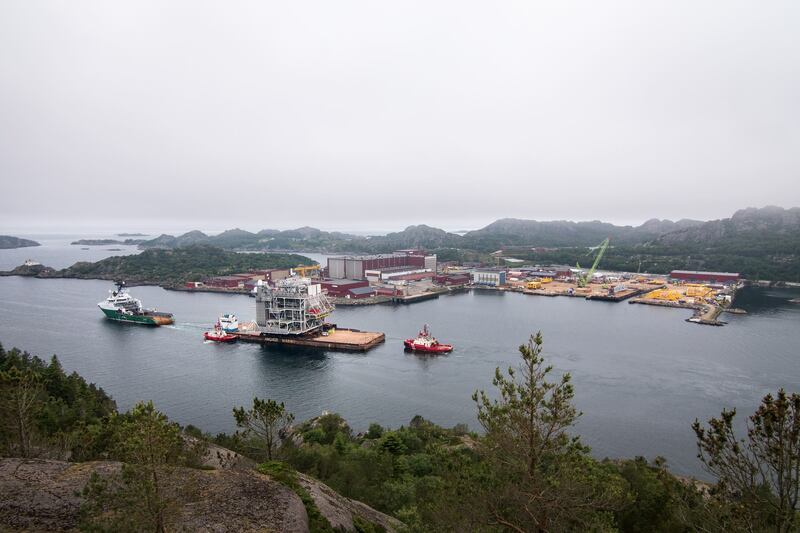 Both the combined utility and living quarter's module and the process module will shortly be towed to the field from Kvaerner Stord and Aker Solutions Egersund. Together with the flare tower these modules will make up the complete Edvard Grieg topsides. The next step for Edvard Grieg is the offshore phase. As soon as the modules are lifted in place, the preparations begin in order to get the field in production. Kvaerner will assist Lundin Norway with hook-up and commissioning of the platform, and the last few months have been spent preparing the offshore campaign, in order to make it a smooth transition. A total of 1,200 people in rotation will be involved in the hook-up phase. Edvard Grieg field is an oil field in the North Sea. First production is expected in November 2015, with an expected production of around 100,000 barrels of oil a day. Over the 18 month period StS Resources & Technology have supplied a total of 70 riggers to assist in the production of the Edvard Grieg Project at Kvaerner Stord and would like to thank everyone who worked in this project for making is successful. We hope to continue this success in upcoming projects.